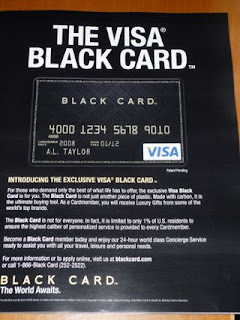 The Black Card has been the ultimate status symbol of late. VIP shoppers from hotel tycoons and rappers flash their limitless plastic (oh, sorry, no plain ol' plastic for these guys - the Black Card is made from carbon. Fancy.) and order up some more Dom. Funny this is, it seems now everyone can get in to this elite club. Or at least 3,000,000 of us. And how do we know this? They are advertising the exclusive privilege in magazines. I think the Black Card has, how do you say, "jumped the shark."